Before Mango Float Royale Melaka started their business in Sungai Putat, the site was already known for mee kari. 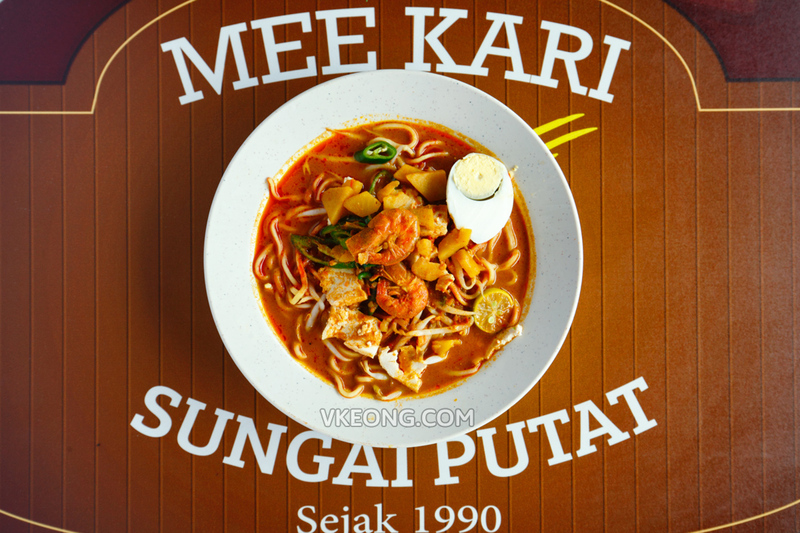 Mee Kari Sungai Putat has been around since 1990 and is currently managed by the 3rd generation of the same family. Now, both businesses are complementing each other, as those who come for mango float can have a proper meal at Mee Kari Sungai Putat, and vice versa. 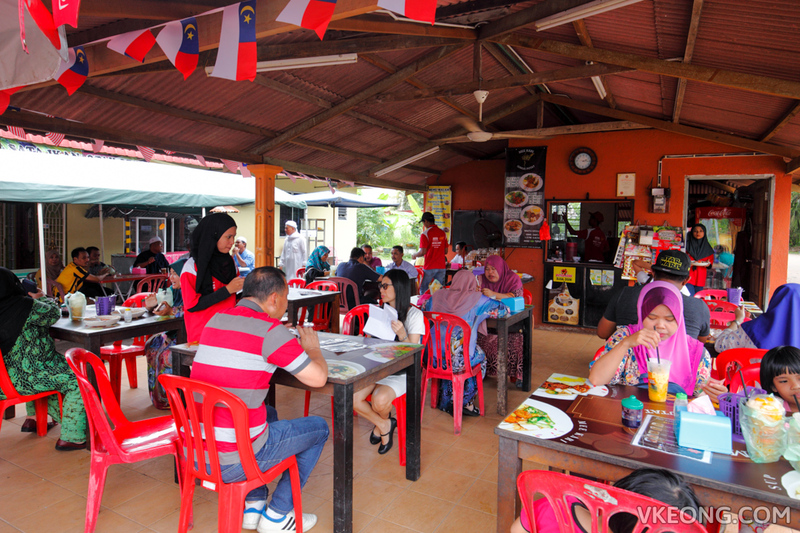 Because of that, the place has transformed into a popular stopover for tourists to enjoy a quick meal before heading into Melaka town. 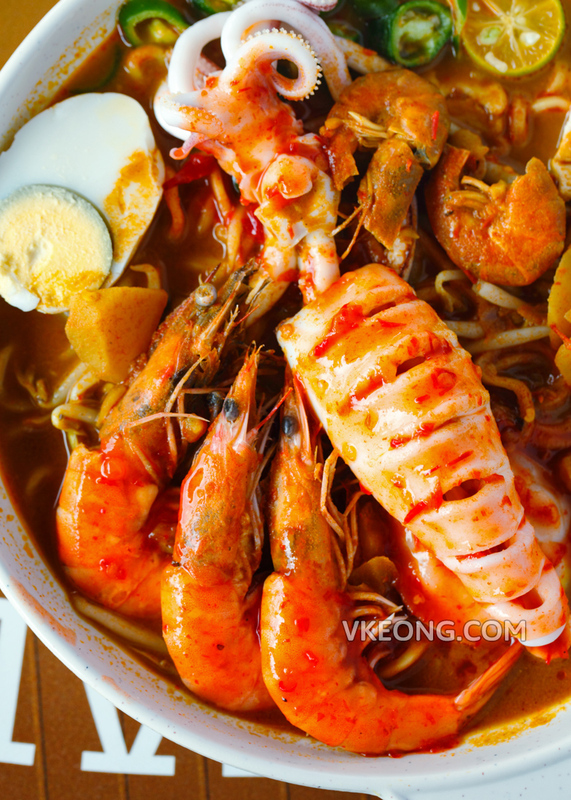 If you love seafood, you should really try their Mee Kari Special @ RM15. 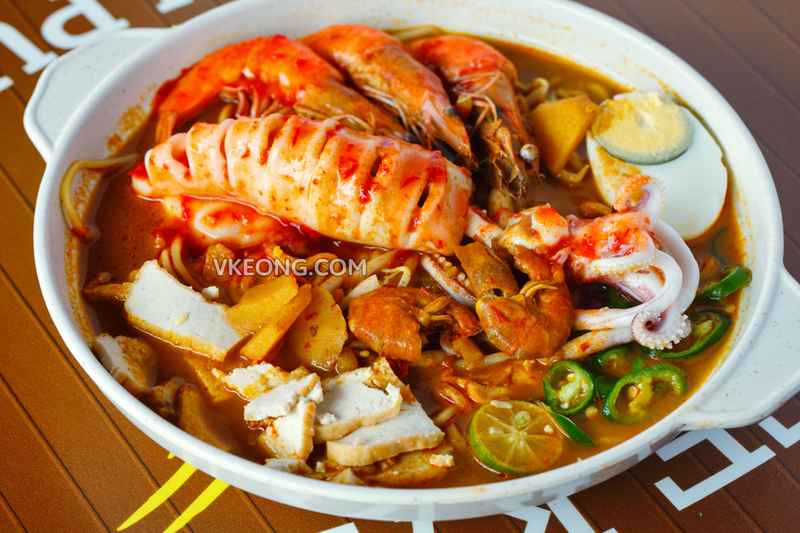 It comes with extra squid and three sea prawns on top of the normal serving (RM4.50) of mee kari. For an extra RM10 or so, the amount of seafood you get is actually worth it. 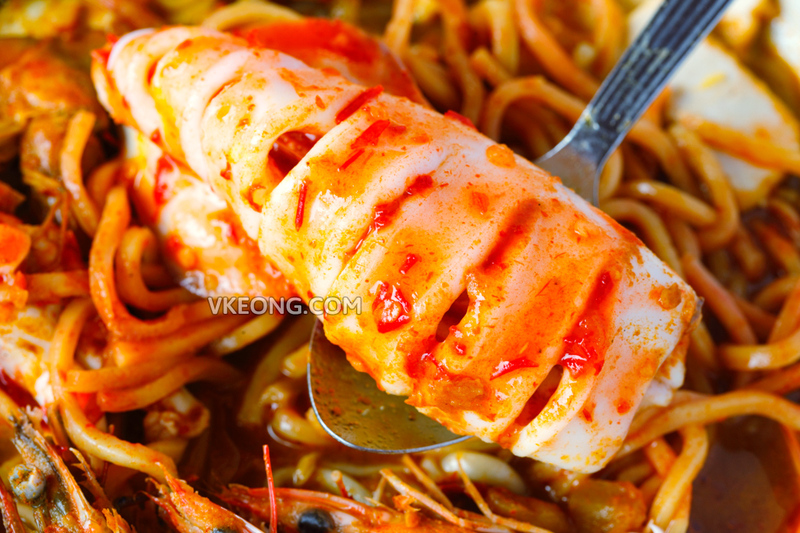 The seafood is also topped with their homemade Thai-style chili sauce, which adds a layer of sweetness and tartness. 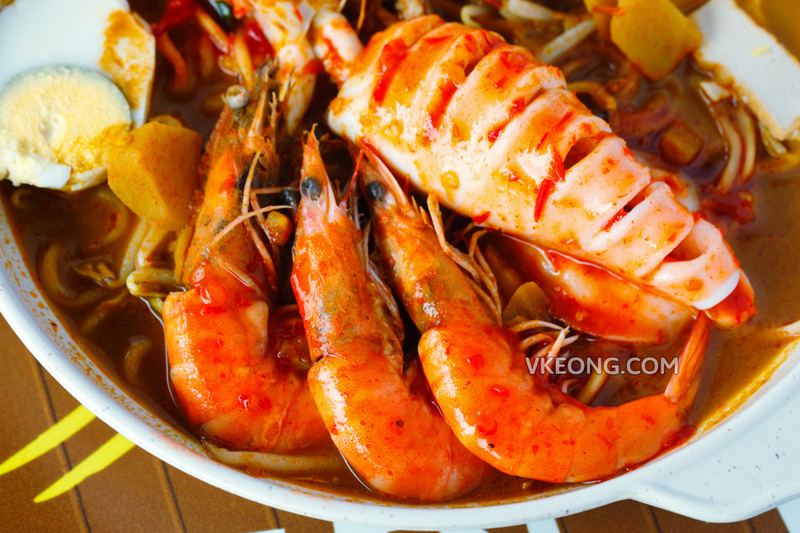 For Mee Kari Special, the squid and prawns are freshly poached upon order in a seasoned simmering water. So they are never overcooked and has the right texture. The same couldn’t be said for the smaller shrimps though, as they have been boiled in the curry broth for a long period until soft. Even the shell kind of melts in your mouth. But on the upside, they are sweet and have absorbed the curry flavor completely, so they are still enjoyable. Compared to the Chinese version of curry mee, the mee kari here packs a stronger curry powder taste and the consistency is richer and not oily at all. If you like your curry full of aroma and spices, I think you will probably find it to your liking. 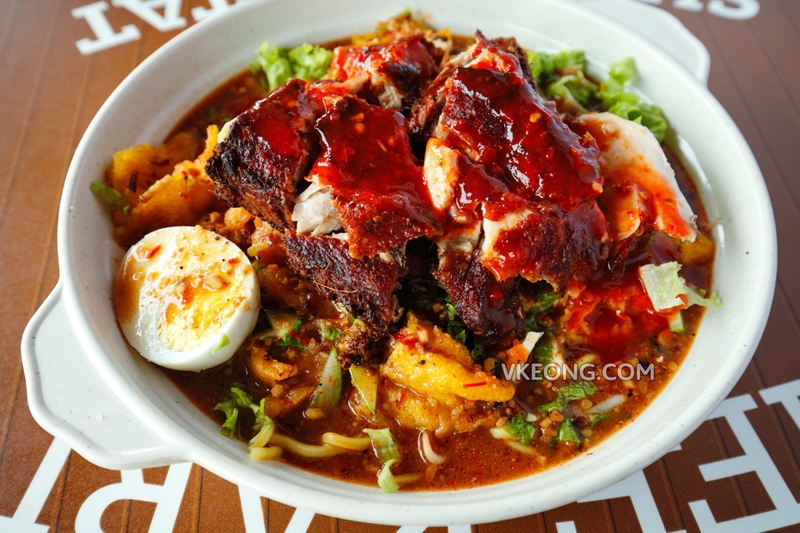 We also tried the Mee Rojak Ayam @ RM10 which turned out unexpectedly delicious and totally impressed us. The rojak sauce had just the right level of sweetness, while the fried chicken’s (Ayam Goreng Kok Kok) skin was paper thin crispy with tender and juicy meat underneath. If you are wondering, the Ayam Goreng Kok Kok is actually their own rendition of ayam goreng berempah. It’s so good that I highhly recommend that you don’t leave without trying it. For a large chicken thigh, it costs only RM5 – perfect to be enjoyed with a refreshing cup of mango float.